The medical mission in Santo Domingo was an opportunity not only to treat the needy patients but touch the hearts of an underserved community which requires not only medical help but health and hygiene awareness, along with social and financial reinforcement. Our medical mission team worked in Santo Domingo for a week from April 6 to 13. We reached the site on the first day to set up the venue in a primary school in a remote village. We temporarily created small cubicles with curtains, arranged examination tables, chairs, mini laboratory space and a pharmacy. The next day there was a huge crowd struggling to enter the main gate that was controlled by local police and the volunteers. Even though I have been involved in medical missions in underserved populations for many years, I was shocked to see people below the poverty line and especially very young mothers with multiple malnourished children. Mainly the children had protein caloric malnutrition, anemia, parasitic infestation and atopic dermatitis. Rarely did I come across an obese person during our one week stay. Fortunately there were not much bacterial infections noted in most of the patients. As I have an ENT background I was able to help many ENT patients, mostly in the pediatric age group. Working conditions were very primitive, including repeated electrical failures and poor sanitation. We did our best to dispense the medications we brought with us. 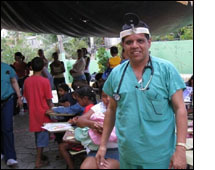 I was impacted by the lack of medical facilities and health awareness and the level of poverty in the community. I deeply appreciate the opportunity to participate in this humanitarian task to help the poor and needy in a developing nation. I would certainly love to join other forthcoming medical missions.